We are nearing the end of the mythic year 1984 where we had been warned that Big Brother is Watching You. Fast forward 34 years people ask why no one is watching them on YouTube, Instagram, Snapchat and so on. On the big screen, Beverly Hills Cop is still bringing in cash. Wham! Madonna and Daryl Hall and John Oates rule the airwaves. It's December 1984 and this Issue #92 of This Old Dragon! Oh I am in for a treat today. This is one of my favorite issues, wonder how it stacks up to my memory. 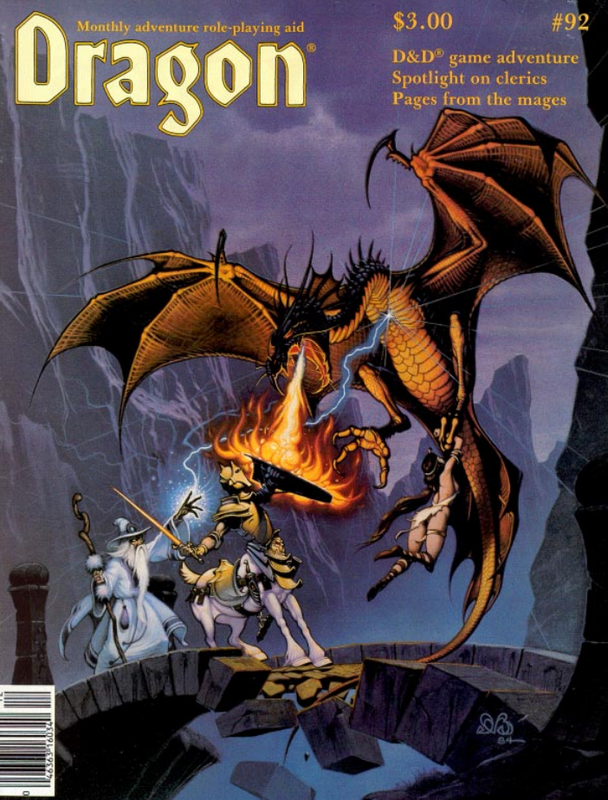 For starters, we have another beautiful Denis Beauvais cover featuring a dragon attack. I always liked seeing dragons on the cover of Dragon. Seemed to make the issue special to me. A quick peek at the contents tells me this is a cleric-themed issue, so I know I would have loved it back then. Letters are still focused on falling damage. Well, at least one letter is. Back then I loved that stuff, I even wrote a program for my Casio programmable calculator to do it. Which of course led to discussions of is the gravity of my game world the same as Earth? Today I'll just roll a d6 per 10 feet and be done with it. The Forum has some more thoughts from readers on Katharine Kerr's Issue #89 Forum discussion about evil PCs. I tried to play in a game once full of evil PCs. Didn't work. No one could trust anyone long enough to get things done. Big ad for the "First D&D Fantasy Novel" Dragonlance's Dragons of Autumn Twilight. We are getting to the so-called "Hickman Revolution" in D&D. 1985, as I have mentioned here many times, was a transitional year for the game and TSR. We only see the hints here, ones that only reveal themselves in retrospect. Then? I had no clue! I Was thrilled to be gaming every weekend. Our first real article is by none other than the man himself. 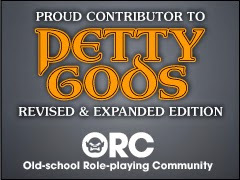 Gary Gygax's From the Sorcerer's Scroll feature gives us Clerics Live by Other Rules. Today this advice is given, but back then it was as close to heresy (pardon the poor choice of words) if it had not been from Gygax himself. To summarize Clerics should get spells and use weapons unique to their faith. We would later see this in 2nd Ed AD&D with the Priest of specific mythoi and in later editions with domain spells. But what Gygax is saying here goes beyond the dozen or score spells that are different. Paul Vernon is up with First, spread the faith which is all about clerics remembering what their purpose really is; they are on a mission from their gods (to quote the high clerics Jake and Elwood Blues). Bruce Barber takes this one step further in his The more, the merrier: How clerics can find new followers. Or cleric conversion rules. I remember getting a Xerox copy of this and stapling it to my cleric's character sheet. The problem I ran into is that there were never enough NPCs that were not trying to kill us to convert. Still it is a nice long article and has some good clerical advice that can still be used in any game today. Kim Eastland and Dan Sample have some text and pictures from the 1984 Gen Con miniatures open. I never read these in detail, my money never went to minis back then, but I loved the little Jabberwock at the end and always wanted one. Speaking of minis, next page over is TSR coming attractions featuring a set of metal minis for the Indiana Jones game. I don't remember if they ever got made, but those would be a prize today. Ahh. One of my faves is up. The Suel Pantheon from Len Lakofka. In this, the last of the series, we get Lydia, Bralm, and Jascar. One day I want to collect all of these (issues 86 to 90 and 92) and look at them as a single work. These gods and their write-ups were a nice working model of what Gygax was saying above about how clerics need to be different. Let the horse buyer beware is an article on how to buy horses from Robert Harrison who is obviously pulling on a lot of real-world knowledge he has. While I don't find this article particularly useful to me I do admire the work that went into it. The Ecology articles are back from Ed Greenwood. This time taking on Ettins in 'Duh Cology of...Duh Ettin! Again, given to us in-universe, even though that universe will not be available for another 2 years. I think this is the first time I began to think of Ettins as two-headed orcs rather than two-headed hill giants. Ed is back for more in Pages from the Mages III, another favorite feature of mine. In particular, I remember going on a quest to recover Aubayreer's Workbook having only the glyph as a clue. I don't remember all the details save that the quest was dangerous and the spells in the book were a bit anti-climatic given the quest. Not that the spells are bad (hardly!) it is the quest was that hard. This is also, at least from what I can tell, our very first mention of The Simbul, "the shapeshifting Mage-Queen". I guess she is looking for a copy of this book too! I think I see a plot hook for my next Realms game (and playing on the events in The Simbul's gift). MAYBE that quest was only half of the tale! Maybe the other half was really to get this book to The Simbul. I am only 30+ years late. Thank you Ed! Of course, that is only one of FOUR magic books. The others also have great history and potential for adventures. Book Reviews are up next. One of the books reviewed is the famous "Name of the Rose" by Umberto Eco. Eco is required reading for anyone playing the WitchCraft RPG from Eden studios. Name of the Rose needs to be required reading for anyone playing a cleric AND anyone who thinks playing a cleric is lame. Our centerpiece is an adventure that I have ran on a couple of occasions. First it is for the D&D game (not AD&D). Jon Mattson's The Sword of Justice. It's nice little low-level adventure that can be snuck in between dungeons or other adventures. It is a nice mystery involving a missing sword, a mysterious elf (remember when elves were mysterious!) and a village full of scared but well meaning folk. A tiny bit of tweaking here and there and it could be run under any edition of the game. Yeah, even 4th (I thought about that version in particular. If I can convert it to 4th I can convert it to anything). Big ad for the TSR 10th Anniversary game pack with four pages of game shops you can buy it from. I checked the local listings and sadly only one or two reamin. I am also kicking myself for not getting this. Well...never had the chance really. A review for the TOON game is up. I liked the idea of this game, but never got a chance to play it. Some advice for characters in DragonQuest, Going up and getting wet: How DRAGONQUEST natives climb and swim by Paul Montgomery Crabaugh. DQ is another game I want to try someday. The short fiction is The Multidimensional Caper by Mark Acres. It is an interesting story and a good example of mixing D&D with Gangbusters. The Ares section is up. The Six Million Dollar Mutant covers cyborgs in Gamma World. Jeff Grubb's Marvel Phile gives us some Heralds of Galactus. I remember reading this one because I never understood the fascination with the Silver Surfer. I got it, I think, a little more after this. Ed going for three gives us (along with Penny Petticord) some answers to Star Questions on Star Frontiers. Ad from The Armory which looks exactly like the stand I bought some paint from over the weekend. Wormy. Dragonmirth. SnarfQuest, where we are introduced to the Gagglezoomer for the first time. Really a fun issue with a lot going on. Plus it has a lot of material that I can still use today in my D&D 5e games. Want to see what I was saying about White Dwarf at the same time? Check out White Dwarf Wednesday #60. I am doing the Witch & Witchcraft Reading Challenge again this year, hosted by Melissa’s Eclectic Bookshelf. This year I also want to focus on the Forgotten Realms, so I am going to combine my reading as much as possible. I had been warned previously that this was not a great book, and it isn't, but it is nowhere near as bad as I was lead to believe. The author, Lynn Abbey, has a solid reputation in fantasy novels. Her work on the Thieves' World novels alone secures her place as one of fantasy's great authors. So I guess I was suspecting more in this one. We get a lot about the Simbul. She is somewhat vain (ok a lot) and capricious, but she also has plans. She wants to get her sometime paramour Elminster a gift. She scrys and sees the perfect gift, a horse named Zandilar's Dancer. Trouble is it belongs to a half-elf lad. Her machinations over the horse get her and the owner Ebroin into all sorts of trouble, even drawing the attention of the Red Wizards of Thay. While I loved the background on the Simbul and like the information on Thay and the Red Wizards I felt this was really three stories crammed into one. Watching her interact with Ebroin, either as herself or in disguise, and watching her interact with a couple of Red Wizards made me realize that the Simbul has a lot of acquaintances, a lot of enemies, but no close friends. Even her people fear her more often than not. While she is not presented in the most favorable of lights here I could not help but really like her. I could see how she got where she was and how disconnected she must feel from everything and everyone except Elminster (who is not really in this book at all). I wonder if she actually loves him or feels she does since he is the only other person that could possibly relate to her. There is affection for her sisters, but even the seem aloof to her. In the end of the tale the horse is all but forgotten and even the reasons for stealing him or not stealing him seem moot. The Simbul is a like a storm. She comes, she goes, and she can leave destruction in her wake. Despite (or because of) that she is still a fascinating character and one I would love to read more about. Witches in this book: The Simbul, aka Alassra Shentrantra Silverhand. Best RPG to Emulate it: This book screams AD&D 2nd Edition. Use in WotWQ: Yes. The Simbul might end up being one of my central Witch Queens. Syluné: Hail Witch-Queen of Aglarond! The Simbul: Hail yourself Witch of Shadowdale. Syluné: Others of (our) sisters have vigor, and low contacts across Faerûn, and a love for danger. I have something rarer: patience. 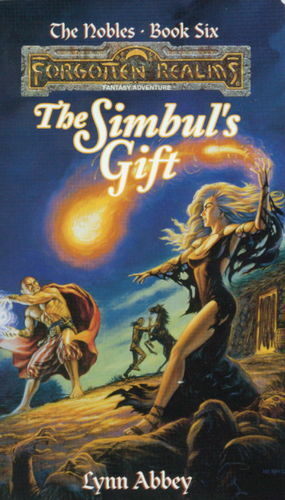 The Simbul: While I have a hunger to kill Red Wizards. I picked up this book based on recommendations by others. I asked if there were any books that dealt with the Seven Sisters and The Simbul in particular. This book was mentioned, but with a caveat that many people didn't like it. I went into the book with an open mind. 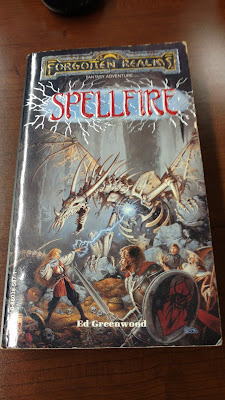 I think I had it better than many becuase I have not really read a lot of Forgotten Realms books yet so I really had nothing to compare it too. 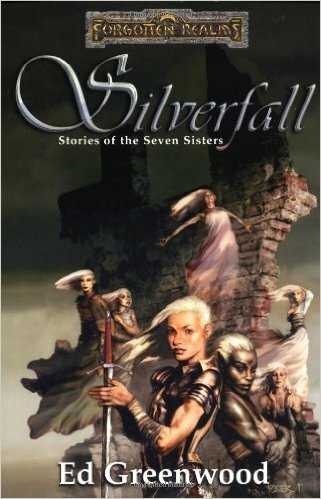 I really enjoyed the idea of the basic structure; seven short stories featuring each sister in an over-arching plot. It is certainly a good idea, but how was it executed? Well...I'll get to that in a bit. First up though, who are the Seven Sisters? Well to people like me who are new to the Realms even I have heard of these women. They are sisters (in the biological and mystical senses of the word) and daughters of the Goddess of Magic Mystra. They had a human father and mother as well, but they are Mystra's. "Chosen" in the book (though there are other Chosen). They all share some basic traits, they are immortal, immune to some magics, unearthly beautiful (natch) and all have long silver hair. Dove Falconhand, a renowned Knight of Myth Drannor. Qilué Veladorn, a drow (her parent were human) and high priestess of he good drow goddess Eilistraee. Laeral Silverhand, the Lady Mage of Waterdeep. Syluné, Witch of Shadowdale and a ghost. The Simbul, the Witch-Queen of Aglarond and maybe the most powerful. Storm Silverhand, Harper, sorceress and Bard of Shadowdale. One thing is obvious from the start. Greenwood loves these characters. They are very well defined in his mind and each has a unique voice. He makes you want to love them as well. Sadly that makes some of the issues with the book more pronounced. The overall story is an interesting one. There is a conspiracy of drow masquerading as humans, slavers, the involvement of various sell-swords, Red Wizards and Priestesses of Shar. How are all of these various factions related? Why are they working together? What is their aim? Each story follows a formula. The Sisters discovers the activity of some group with nefarious ends. The Sister goes in magics a-blazin' (more or less) and takes out all the mooks, some other big-badder guy comes in and beats the sister to a bloody pulp (sometimes magically, sometimes physically), she has to tag in the next sister. Again there is nothing wrong with a formula, and if it is done well it can be a satisfying build up to a conclusion. Sadly that is not what we get really. The conclusion never lives up to the build up. The troubles the sisters have never really justify the eventual revealed plot. I had some other issues as well. Each sister has some reason to take off her clothes and move around naked. Even the ghost. Granted for some, like Qilué, this is needed. She is a High Priestess of Eilistraee so it is part of her religion. Also there is an awful lot of the sisters kissing others "passionately" even people they just met or people they by no logical means should be kissing. I guess this is all "fan service" really. There is a bigger issue though. The Sisters go in to each conflict over-confident and underestimating their enemy. I get they are super-powerful and there needs be conflict worthy of their skills. But sometimes they make really dumb choices to get to that point. Not ones that powerful, intelligent, immortal magic wielding women should make. Compare their actions to those of another powerful witch Rachel Morgan. Rachel makes mistakes, but Rachel is in her mid-20s for most of her series and still learning. The mistakes she make makes in her first books would not be repeated in later books. They need to act a little more intelligent and a little less "Chaotic Bimbo". To be fair, everyone told me this was a problem with this book. I did enjoy it. I was just hoping for more. Witches in this book: Certainly The Simbul and Syluné. Maybe even Qilué. Myra the Dark is described as a cleric, but is very much a witch of Shar. Are they Good Witches or Bad Witches: Mostly good, Myra is obviously evil. Best RPG to Emulate it: Again, any edition of D&D would work, but this one is 3rd Edition. It does allow for better multiclassing. Most of the material though is based on the 2nd Edition versions I think. Use in WotWQ: Hell yes! Like with Spellfire, this book is filled with ideas. I will certainly use these characters in my games. Now that I am playing in the Realms maybe the "Witch Queen" that is killed to start the War of the Witch Queens is The Simbul? I would hate to do that, but it would be a seismic shift in the game. Shandril is just small town girl, living in a lonely world...a wait. Well, she is lonely and living in a small town. She is an orphan girl working for ex-adventurer Gorstag in his inn. She dreams of going on an adventure of her own. So seeing a potential group who are short a thief, she steals their weapons and lets them know that if they want them back they need to take her on. Soon she is swept up in the glory of adventure...which mean eating bad food being cold and afraid most of the time. But Shan is special, and she finds herself in the ruins of Myth Dranor, pursued by an evil sorceress and devils. Rescued by the infamous Knights of Myth Dranor and none other than Elminster himself. It seems Shandril has a power she is only now learning about. She is a spellfire wielder. She can absorb magic and turn it into blasts of flame so hot that with out training she destroys first one, then two and finally three draco-liches (great undead dragons of terrible power). Keeping mind that most people never even meet one, let alone survive it! Now she is being chased by the Cult of the Dragon, another group of evil Mages and who knows all else and they all want her secret. or her dead. This is the first Forgotten Realms novel I have ever read. There is a vast library of knowledge in and around the Realms and I have been pretty much blind to it for various reasons. I picked this book a local library book sale. I was always a fan of the Clyde Caldwell cover art and even have it hanging in my game room. The book is enjoyable. It is clearly gamer fiction, but it has it's moments. The author has a lot of affection for these characters, that is obvious, and you can tell there is much more goign on in his head than what is down on paper. My issues as a newbie here was there were too many characters to keep track of. Shandril and Narm are likable enough and Gorstag was the most relatable to me. It did however, make me want to read some more Realms books. Rather looking forward to it. 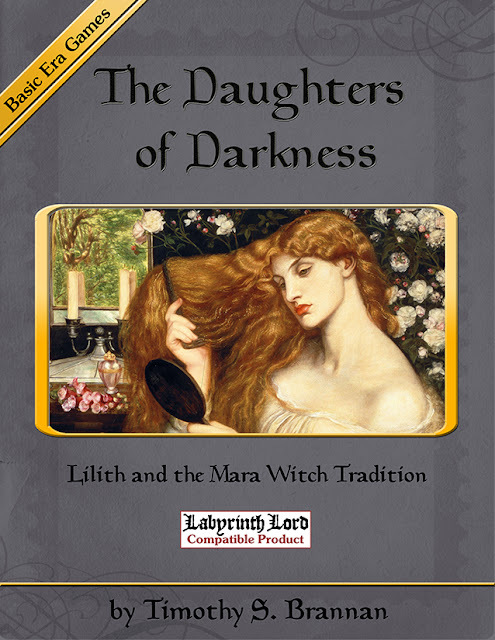 Witches in this book: Certainly The Simbul, The Shadowsil and maybe, just maybe, Shandril too. Best RPG to Emulate it: This book screams 2nd edition AD&D even if was published at the end of 1st edition AD&D. Either would work out well. Use in WotWQ: Hell yes! I have started on a quest of my own to read about the Seven Sisters (which The Simbul is part of) and use them in my games. Let's have look at Symgharyl Maruel also known as the Shadowsil. She certainly "feels" like a witch. An evil witch to be sure, but recognizable. AC 6; MV 12; hp 36; THAC0 15; #AT 1; Dmg by spell; MR Nil; SZ M; ML 18; AL NE; XP 12,000. S 9, D 16, C 14, I 18, W 15, Ch 15. Special Equipment: Ring of dragons, ring of protection +2, rope of entanglement, wand of fire. Description: Tall, slim, and cruel, The Shadowsil was likely a Cult enforcer or high-level operative of some kind. She wore purple robes and was a former apprentice and paramour of Elminster before she turned to cruelty and evil. She died in his arms, proclaiming her love for him and her regret over their lost love. If I were to turn her into a witch I'd use my Basic Witch rules with the Advanced options and make her 18th level. She would loose a 9th level spell, but gain powers. This is also a good time to try out a Draconic Tradition. My son and I have talked about Dragon Witches before, what they might be and how they work. There are also the Dragon Witches from the Tarot comic and some others. Last week I discussed what I thought about the new witch class for 4E. One of the slights I felt was the lack of some good witch Paragon Paths. Obviously the Essentials format now includes a "default" Paragon Path and the book could not include multiple Paragon Paths for all the classes. So I am going to take something I thought was a weakness of the class and turn it into a strength. Today I want to look at what sort of previously published Paragon Paths work well for the witch. First up, the Legendary Witch from Heroes of the Feywild is a perfect fit. It really just extends the Heroic Tier witch and gives some power based on the coven the witch is in. Nothing fancy really. 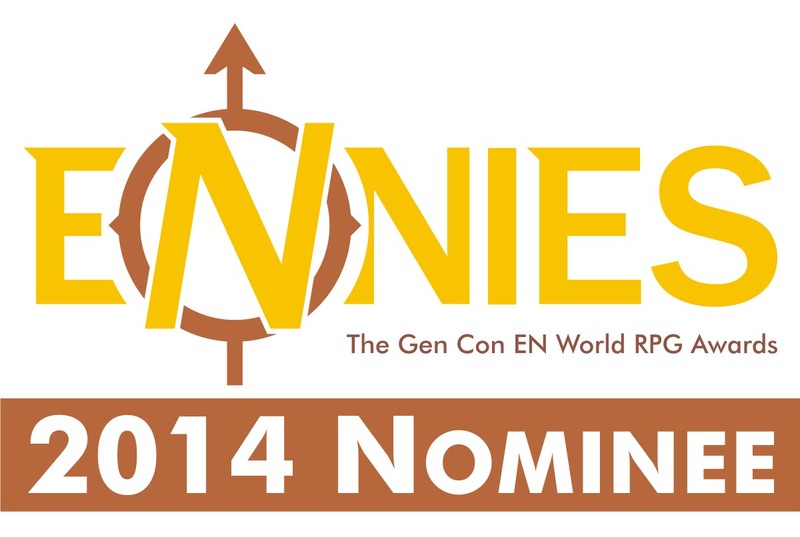 Starting with the core rule books (PHB and Essentials) and working out here are some of my choices. The Blood Mage and Spellstorm Mage from PHB1 are good choices. With a bit of fluff, these can become a Blood Witch and Tempenstarii with no changes to crunch. 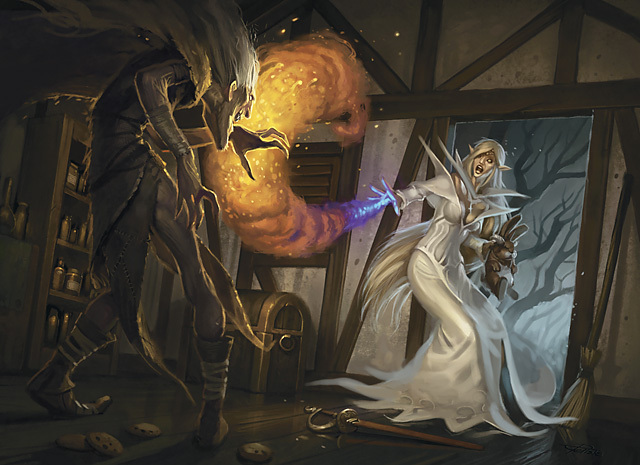 Arcane Power gives us a number of options as well, but really only one Paragon Path stands out as sufficently "witchy". The Weaver of Chance has background that is compatible with the witch's and the powers work well too. In fact with this Path you can finally make the Scarlet Witch character you always wanted. Moving out to the Campaign Worlds we get more choices since they are designed to be something more akin to what Prestige Classes were in 3e. The Forgotten Realms is full of wizards, and even the Hatharans and Simbul are more or less witches. The Simbul is even called Witch Queen of Aglarond and the Paragon Path based around her, Simbarch of Aglarond, is a great one for a witch to take. Another nearly perfect one for the witch of a Full Moon coven is the Silverstar. Neitehr of these need to be changed in terms of fluff or crunch. From the sister book Heroes of Shadow, the witch can take on powers of Necromancy or Nethermancy as she chooses. There is also the Ravenkin path as sort of a dark parallel to the Silverstar. The Shadowthief and Shadow Shaper are also decent choices. Moving on to the issues of Dragon, we have the Vistani Execrator (#380), which is thematically a good choice if your witch has some Vistani blood. For witches that focus on their familiars there is the Familiar Keeper (#374). There are others, based on races and skill or feat choices, but these look like they are the best to me. Now the Legendary Witch doesn't look so lonely.